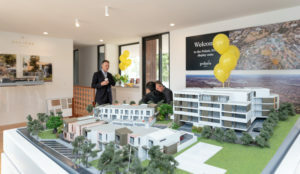 A selection of only 10 three and four bedroom townhouses were launched and keen purchasers enjoyed barista-made coffees, complimentary burgers, games, face-painting and more! Award-winning architecture and interior design firm, Clarke Hopkins Clarke has drawn upon their 50-plus years of design experience to create the stunning residences. From the first vantage point outside, the townhouses reveal themselves with external timber-look cladding, double glazed windows, evocative of the ever- popular and stylish Scandinavian style. Once inside, the feature timber joinery continues, alongside grey natural stone benchtops, chrome tapware and the all-important feature island bench that life so often revolves around. Each modern and stylish townhouse flows over two levels and is surrounded by landscaped paths with direct connectivity to the Town Centre, home to over 35 speciality stores, Woolworths, Dan Murphy’s and Chemist Warehouse. With prices starting at $745,000- these townhouses won’t last long! For more information visit the display suite, corner Galileo Gateway and Plenty Road, Bundoora VIC 3083 Open Wednesday to Thursday 11am-1pm and Weekends 11am-2pm or call Brett Hallam on 0418 318 283.